Arsenal are through to the final of the FA Cup after a penalty shoot out victory over Wigan. Lukasz Fabianski was the hero after saving two of the Latics' spot kicks and Santi Cazorla sent Gooners into meltdown as his penalty sent Arsenal into their first FA Cup final since 2005. 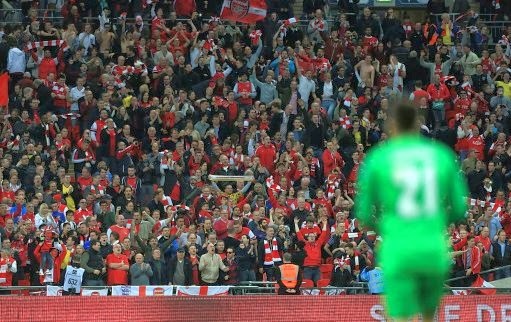 In a game which didn't see the Gunners perform at their best, no one will worry about how we got to the final, just that we are there. Arsene Wenger made four changes om the side which lost to Everton last weekend. Fabianski came in for Wojciech Szczesny in goal, Aaron Ramsey replaced the suspended Mathieu Flamini in midfield, Alex Oxlade-Chamberlain took the place of the injured Tomas Rosicky and Yaya Sango started up front in place of Olivier Giroud. And it was Oxlade-Chamberlain who had Arsenal's first chance inside the opening minute. The youngster cut out a pass in the middle of the field, played the ball wide to Ramsey and then attempted to get on the end of the Welshman's low cross. Sanogo got a touch on the ball and the Ox couldn't control it and the ball rolled harmlessly through to Scott Carson in the Wigan goal. The England international was instrumental in Arsenal's best chances in the fourth minute, driving forward with the ball and taking on the Latics' defence by playing a one-two with Sanogo. And then moments later providing a decent cross for Sanogo to head towards goal which was saved by Carson. Wenger's men had a lot of the possession but little penetration as the sides matched each other in the centre of midfield. Santi Cazorla and Lucas Podolski struggled to get involved in the game at the highest areas of the pitch closest to Carson's goal. Arsenal's best attacking threat was coming from the right where Oxlade-chamberlain and Sanogo combined. The Gunners were kept ticking over by Mikel Arteta who never stopped patrolling the area in front of the back four. The Gunners could have had their first goal in the 25th minute from a Cazorla corner which was headed towards the back post by Vermaelen. Sanga was there and unmarked, but the Frenchman was unable to get his left foot volley down and on target. There was little in the way of creativity from Uwe Rosler's men. Fabianski wasn't forced to make a save in the opening 30 minutes of the game. Wenger had tasked his full back with little attacking duty. It was a rare occurrence when either Sagna or Nacho Monreal ventured into the opposition half. Set pieces seemed to be Wigan's best hope of scoring. But Per Mertesacker was instrumental in organising the Gunner's defence. And Wigan had their first shot on goal in the 38th minute but Fortune's effort was easily saved by Fabianksi. Podolski's biggest involvement was taking a free kick which went just wide in the 40th minute after Oxlade-Chamberlain was felled. Sanogo was set free for a one-on-one chance by Podolski with four minutes of the half remaining. But the Frenchman's first touch was heavy and Carson was quickly off his line to close down the angles. No changes were made at half time. And Arsenal's first chance was fashioned five minutes into the second period when Cazorla set through Sanogo but the Frenchman couldn't get hold of the ball and it was easily gathered by Carson. Wigan won their first corner of the game in the 53rd minute. But Sanga closed down McArthur's effort and the danger was cleared. At the other end Podolski was trying to get more involved in the game but nothing was coming off for the German. Then in the 58th minutes Wigan had a penalty. Mertesacker bringing down Callum McManaman in the box. Moments before the Wigan attacker had backed into Monreal, causing he full back to collapse on to the pitch. McManaman then brust forward and cut inside the box and the German rashly challenged the Wigan player. Before the spot kick was taken, Monreal was replaced by Gibbs. Four minutes later Jordi Gomez had the ball in the back in the net and the FA Cup holders were in the lead. Fabianski diving the right way but the ball was just out of reach. Rosler Rosler made his first change of the game, taking off the Chelsea loaned player Josh McEachran and replacing him with Jack Collison, on loan from West Ham. With 27 minutes to go, Arsenal's season was hanging in the balance. The Gunners had to attack and take the handbrake off. Aaron Ramsey created a chance from the right for Sanogo, which the Frenchman couldn't put on target, but the wheels were starting to go in a forward motion. McManaman, argbly Wigna's most dangerous player was substituted with 23 minutes to go and replaced by Nick Powell, on loan from Manchester United. And Wenger made his second change with Podolski being replaced by Giroud. There were boos inside the stadium at Wenger's decision to bring off the German, but he was peripheral in the game. Wenger switched to 4-4-2 with Cazorla moved to the left and Oxlade-Chamberlain on the right. He also allowed his full backs to roam, and Gibbs made most use of his freedom to serge forward and create chances. And the Gunners were moving in the right direction. Arteta set Sanogo free but the Frenchman couldn't get a shot away. Oxlade-Chamberlain had a shot from distance which was saved and Sagna had a cross which was over hit. With 13 minutes to go referee Michael Oliver awarded a free kick to Wigan outside the area as he judged Arteta to have clipped Powell. The set piece forced Fabianski into a punching save which put the Gunners on the counter attack but Oxlade-Chamberlain couldn't get onto Giroud's through ball. The French striker was taken out by Gomez, who was the first player to go into the referee's note book. The clock was counting down. With ten minutes to go, Oxlade-Chamberlain took a corner from the right. It was poor but the ball came back out to the England international who whipped in a cross Sanogo's effort came back off the post. A minute later Gibbs had an header cleared off the line by Stephen Crainey after his effort was saved by Carson. The momentum was with the Gunners and they drew level with a Mertesacker header. Cazorla took the corner which was headed clear only so far as Oxlade-chamberlain on the edge of the Wigan box. He shot toward the far post by his effort was off target and Mertesacker, who hadn't retreated from the corner had taken up a position on the back post. He rose above the Wigan defence to head down and beat Carson. Wigan brought on Gary Caldwell for Ivan Ramis with five minutes to go. Giroud forced a good save from Carson with three minutes to go, Vermaelen headed an Arteta free kick into the six yard area - but no one was there and Mertesacker headed over from a Cazorla corner. In injury time, McArthur was bookedd for a foul on Oxlade-Chamberlain. Sanogo cleared a Wigan corner and Giroud couldn't connect with a cross. Collison was booked for a foul on Gibbs. In 90 minutes it ended level. If the Gunners were going to win the tie it would be in extra time or through a penalty shoot out. In the first period of extra time, Sango made Carson produce a fine save from a snap shot and had an effort which went over the bar. In the second period of extra time, Fabianski got a touch of the Almunia's when he rushed out of his box to get the ball of Powell. At the other end, Oxlade-chamberlain beat Carson but his effort hit the woodwork instead. It just wasn't going to be his day. With 22 minutes of extra time, Ramsey was replaced by Kim Kallstrom. Cazorla was fouled by Jean Beausejour in the final minute of extra time and booked. At the death Kallstrom couldn't get his shot away and the match ended 1-1. 0-0 Fabianski saves from Caldwell. Arsenal go through to the FA Cup final!